January 15, 1993 – Salvatore Riina, the Mafia boss known as “The Beast”, is arrested in Sicily after three decades as a fugitive. 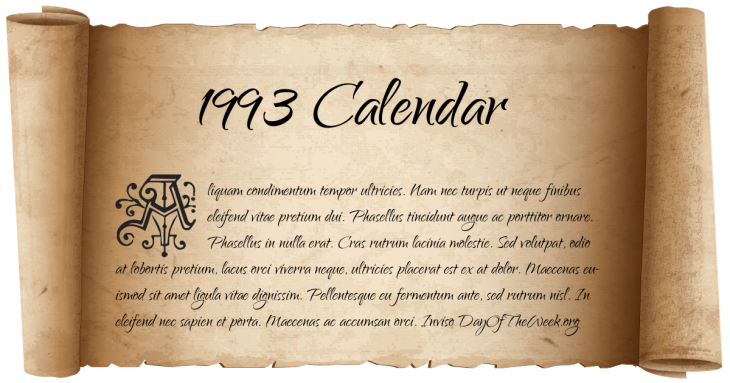 January 23, 1993 – New Year’s Day in Chinese calendar. Start of the year of the Water Rooster in Chinese astrology. March 22, 1993 – The Intel Corporation ships the first Pentium chips (80586), featuring a 60 MHz clock speed, 100+ MIPS, and a 64 bit data path. April 19, 1993 – South Dakota governor George Mickelson and seven others are killed when a state-owned aircraft crashes in Iowa. August 9, 1993 – The Liberal Democratic Party of Japan loses a 38-year hold on national leadership. October 23, 1993 – Shankill Road bombing: A Provisional IRA bomb prematurely detonates in the Shankill area of Belfast, killing the bomber and nine civilians. November 30, 1993 – U.S. President Bill Clinton signs the Brady Handgun Violence Prevention Act (the Brady Bill) into law. December 10, 1993 – The last shift leaves Wearmouth Colliery in Sunderland. The closure of the 156-year-old pit marks the end of the old County Durham coalfield, which had been in operation since the Middle Ages. December 11, 1993 – Forty-eight people are killed when a block of the Highland Towers collapses near Kuala Lumpur, Malaysia. Who Were Born On 1993?